ETHIOPIAN TRADITIONAL EVENTS AND FESTIVALS: Ethiopia is unique with its Julian-based calendar differing in dates of Christian holidays from the Gregorian calendar (Christmas, Easter, and Epiphany are the major ones). Therefore, in Ethiopia, some holidays can be celebrated twice, including New Year’s Day. The Finding of the True Cross (Maskal) is uniquely celebrated in Ethiopia. NEW YEAR (ENKUTATASH) : Ethiopian New Year’s Day, falling on September in the Gregorian calendar (or September 12 the year before Gregorian leap year), marks the perfect season, when yellow daisies (adey abeba) start to blossom in the midst of the green countryside, after the long rains end. The day is also linked to the Queen of Sheba, her famous travel to Jerusalem, and what happened afterward. FINDING THE TRUE CROSS (MASKAL) : Unlike Enkutatash, there is an outdoor celebration on a small- scale in everyone’s backyard as well as a grand damera celebration, which involves a Christmas tree- looking thing, made of dried sticks decorated by green adey abeba, by this time very abundant. Huge bonfire is burned almost everywhere, but accompanied by a parade of choirs from different churches, specially, at Maskal Square in Addis Ababa. The damera’s history is connected to Empress Helena, mother of Constantine the Great. While searching the original cross of Jesus, she prayed for a sign and got one from a smoking, upright bundle of sticks. The direction that the last stick standing fell would be the location where the true cross could be found. A piece of the true cross was then brought to Gishen Mariam Church in Wollo, Amhara Regional State, Ethiopia. Therefore, in memory of Empress Helena, on the Eve of September 27 (the actual day the cross was found) people make their own damera and sing and chant around it. If in Addis Ababa, Maskal Square is the place to be. CHRISTMAS (GANNA) : The Ethiopian Christmas falls on January 07 (or 08 during leap year) ever year. The day celebrates the birth of Jesus Christ. Christmas is warmly celebrated in Ethiopia. This festival has a special place in the hearts of many Ethiopians—according to Ethiopian tradition, one of the Wise Men who visited the baby (Jesus) at Bethlehem, was from Ethiopia. During this festival, night mass is conducted in all churches, people who go to churches to attend the night mass lit candles, most people, particularly, women wear white traditional clothes, priests and young boys and girls chant and dance, people play thousands of years old game, Ganna, (one of Ethiopia’s traditional games which is much similar to that of the “hockey” game in Europe and America), choirs sing spiritual songs at churches and more. 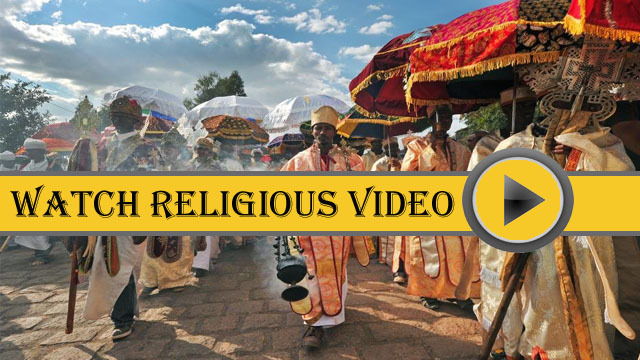 But, the warmest ceremony of this festival holds at Bete-Giyorgis in Lalibela, in Gondar, and at the Trinity Cathedral Church in Addis Ababa. EPIPHANY (TIMKAT) : Timkat is the warmest of all ceremonies celebrated 12 days after Ganna (Ethiopian Christmas) in Ethiopia. This festival commemorates the baptism of Jesus Christ. On that day of the ceremonies, the symbol of the Ark of the Covenant is present on a table of flat-topped block used as the focus for a religious ritual on the head of the priest. After the morning divine liturgy near a pool, a mass sprinkling of holy water takes place before the crowd, after which the Arks return to their holy places with an amazing chanting, singing, and dancing of choirs as well as of the masses. OTHER FESTIVALS : There are also many other festivals that are celebrated here in Ethiopia annually, and some them include, Ashenda (the culture of Tigray and Sekota people which falls from 21 - 23 August), Irecha (the Oromo peoples’ thanks giving day, celebrated on the following Sunday after Maskal Festival), and Ethiopian Easter. Take your morning flight to Addis, in the afternoon attend the warmest eve of Maskal Celebration (the Finding of the True Cross Festival), and in the early hours of the evening, transfer to the airport to catch your evening return flight to home. Full-day you should attend the warmest eve of Timkat Celebration (Ethiopian Epiphany) and in the early hours of the evening, transfer to the airport to catch your evening return flight to home.